Visionary Solutions Sdn Bhd is the sole distributor for DYSON product range including the Dyson Airblade™ hand dryer - the world’s fastest and most hygienic hand dryer. The Dyson Airblade™ hand dryer dries hands in just 10 seconds, up to four times faster than warm air hand dryers. It is powered by the Dyson digital motor that spins at 90,000 rpm, producing sheets of air travelling at 690 km/h, which literally scrapes water from hands like a windscreen wiper. With a faster dry time and no energy-hungry heating element, the Dyson Airblade™ hand dryer costs up to 80 percent less to run than warm air hand dryers and 97 percent less than paper towels. The Dyson Airblade™ eliminates the need for paper towels, thus generating 70 percent less carbon emissions into the environment, making it a highly environmentally friendly hand drying solution. Many clients in the Food & Beverage, Tourism, Retail and Manufacturing industry are benefiting from the Dyson Airblade™ as it continues to provide their business with immediate cost savings by eliminating the need for paper towels, lower energy consumption and as a result also reduced their business carbon footprint. 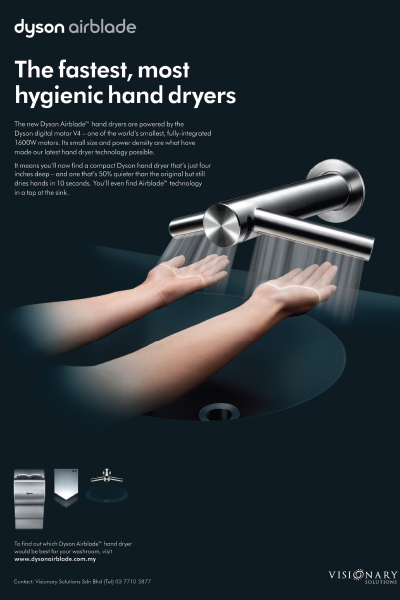 The multi-award winning Dyson Airblade™ is the only hand dryer that is certified hygienic by NSF (www.nsf.org). It is also certified hygienic by HACCP, a food management system recognised by the Ministry of Health that addresses food safety. Other global green awards and credentials include the Green Business Awards UK, National Energy Efficiency Award UK, US Green Building Council, Janus de l’Industrie, France. Dyson Airblade™ is also the first hand dryer to be awarded the Carbon Reduction Label from the Carbon Trust.